I have a 2 year old red nose pitbull. I've had her since she was a puppy 5 weeks old. She showed signs of aggression when she was 5 months old and with me working on her she stopped. She was always good with other animals I took her to the dog park every 2nd day and had no problems. Well this weekend something diffrent happened. We were all sitting around the table and my pitbull was laying under the table and I just happen to look under and she was shaking and has her tail bewtween her legs. I got up and was trying to figure out what happened. Then after we got her out when the other dogs came around she would growl and show her teeth. My husband and I couldn't understand what happened to her. She was showing aggression. My husband decided to take her outside before something happened. She went pee and once she did that she was better. When she came in she was back to herself running with the dogs licking their ears. So after that we left and came home. My husband's sister was coming over for game night and she was bringing her beagle dog. (My dog only met the other dog once. And my dog was in her cage at the time.) So we decided to put my dog in her cage and my sister-in-law's dog in her cage. Then we would take turns to let the dogs out. My dog would run to the cage growl at the other dog and try to attack it through the bars then run back to her cage. (Let me mention that my dog had her bone in her cage and the other dog had a bone in her cage.) So after that my cage was open and my pitbull would not come out. She laid on her bone the whole time. Once our visitor left my husband went to the cage to tell her 'come out it was okay now', she started growling at him. (She's never done this to him). Then he went to touch her and she showed her teeth and snapped at him. His finger was bleeding all over, she was mad. I'm pregnant and will be having a baby in 4 weeks and his thought was my dog will hurt the baby. 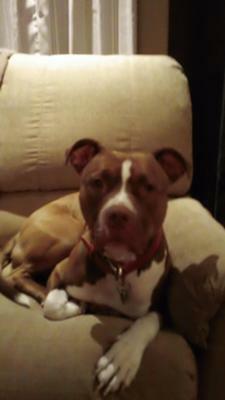 But before my husband and I got married it was just me and my pit living alone for a year and a half. So after that she would not come out and looked like she was guarding her bone. I couldnt even get close to her she wanted to snap at me too. My husband had an idea to grab her chain and say wanna go for a walk. She came right out after 2 hours but she always wanted to run back to the cage for the bone. I do not understand why she is doing this. After she was out I grabbed the bone and put it up. We went for a walk and once again she was back to normal. But when we got home she spend 20 min sniffing for her bone and showing signs of being unsure around us. Could there be an explanation to her doing all this in 2 days? Maybe so much stuff going on? bad time in my life. She is my life, But so is my husband and so will be my baby. I'm so scared she will get worse and we will have to put her down. HELP PLEASE!!!!!!!!!!!!! The first thing I would recommend is to have your dog thoroughly checked by your vet. Sudden behavioral changes can be a sign of physical illness. If her energy level and appetite are normal, this is easy to overlook. But some medical problems are not apparent physically until the disease has advanced. So to be on the safe side, have her checked out. You mention that she was aggressive as a pup, but you don't specify what you mean by this. It would be helpful to know what the behaviors were that you considered aggressive and whether these behaviors were directed towards other animals or towards humans. Dog aggression and human aggression are two separate issues. Dog aggression is a trait that is not uncommon in adult pit bulls. So it's good to keep in mind that a pit bull who enjoyed the company of other dogs as a puppy, may change her mind and become less tolerant of other dogs as she matures. Your girl is in the age range where this switch often takes place (14 - 36 mos.). So, this may account for some of what you are observing as a change in her. Assuming she checks out medically and she has no real history of human aggression other than the recent 'bone incident', it sounds like the central issue your girl has at this point is resource guarding. This is instinctive canine behavior. It's not for nothing that the phrase 'like a dog with a bone' is used to describe someone who guards something jealously and sometimes fiercely. While 'crate and rotate' is usually a reasonable way to manage two dogs who aren't friendly or familiar with each other, the presence of a desired object seems to have tipped the scales for your girl. When she was out of her crate and saw the other dog crated with a bone, she wanted that bone. At the same, she's afraid of losing her bone. So she runs back to her crate to check on it. When you wanted her to come out of her crate after the other dog had left, she's still guarding her bone and doesn't want to come out. Your husband reaches in the crate. And thinking "Oh no now HE wants my bone! ", she snapped. The lesson here is that when other dogs are present make sure there's nothing to fight over--food, toys, treats, etc need to be put away. However, your dog needs to be able to allow you to take something out of her possession for her own safety as well as yours. So the resource guarding issue needs to be dealt with ASAP. MINE! - A Practical Guide to Resource Guarding in Dogs by Jean Donaldson is an excellent book. It not only helps you understand the many forms resource guarding can take, it shows you how to deal with each of them effectively. This is particularly important for you with bringing home a new baby. Resources, aren't only objects--sometimes a dog can become jealous over an owner's attention. That's not to say that your dog will become jealous or that she would harm your baby. But the 'owner-as-resource-to-be-guarded' is a dynamic you should be familiar with and know how to curb it ahead of time. Good luck. Feel free to write back and let us know how things are going. And congratulations on your new baby. Comments for My 2 year old pitbull is not acting like herself! Definitely get her checked by a vet. i just took my dog in who was starting to snap at me and found out he has spinal problems and has been in pain. she might have a bladder infection..anything, you never know. good luck! Gale has pegged it! Allow me to share the highlights of "Life With A Resource Hog-Dog!" One of our four dogs is a resource hog. Be it a bed, a bowl, a ball, or his Daddy -- it has to be HIS and no one else is supposed to touch it. For that reason, we have to be very vigilant with The Resources. Everything is closely supervised at all time, including the dogs. To play fetch with one dog, means the other three dogs are inside & the ball comes in the house to be put in a shelf when Ball Time is over. Meal times are segregated and crated. One last side note: a 2-year old Pibble is just finishing out her move to adulthood, so once you get this little side-track taken care of - you should enjoy an adult dog from here on out! My girl is 5 and has always trying to mount me??? No one else but just bought a 24 week old pup and now she does it to him as well as me??? Why?? And she marks every sent of dog wee outside....I thought that was a male thing? ?